What happened when one of today’s best-loved food writers had a change of appetite? Here are the dishes that Diana Henry created when she started to crave a different kind of diet – less meat and heavy food, more vegetable-, fish- and grain-based dishes, often inspired by the food of the Middle East and the Far East, but also drawing on cuisines from Georgia to Scandinavia. Curious about what ‘healthy eating’ really means, and increasingly bombarded by both readers and friends for recipes that are ‘good for you’, Diana discovered a lighter, fresher way of eating. From a Cambodian salad of prawns, grapefruit, toasted coconut and mint or North African mackerel with cumin to blood orange and cardamom sorbet, the magical dishes in this book are bursting with flavour, goodness and colour. It’s all about opening up your palates to new possibilities. There is no austerity here, simply fabulous food that nourishes body and soul. "I have always been a passionate admirer of Diana Henry's; in her, I find a kitchen kindred spirit. Her new book covers slightly new territory (I say slightly, because her robust and yet poetic attitude is still prevalent) in that it addresses what some might call 'healthy' food, but I prefer to see is 'templefood'. As ever, her recipes are gorgeously greed-inducing, and the feel of the book - the beauty of its photographs should be mentioned here - is calmly but gloriously uplifting." "Healthy eating gets a delectable makeover from one of Britain's most celebrated food writers. Aside from the brilliant recipes this book is visually gorgeous, with layout, typography and photographs complimenting the content wonderfully. What's not to love? It's food that tastes great and is healthy too, which is basically as good as it gets." "Everything Diana Henry cooks I want to eat! She knows her colours, she knows her flavours and she knows how to marry them perfectly." "Absolutely gorgeous and so inspiring! " 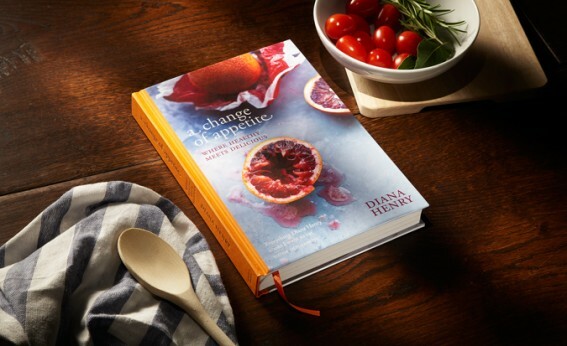 "Diana Henry’s passion is infectious and her recipes tantalizing."